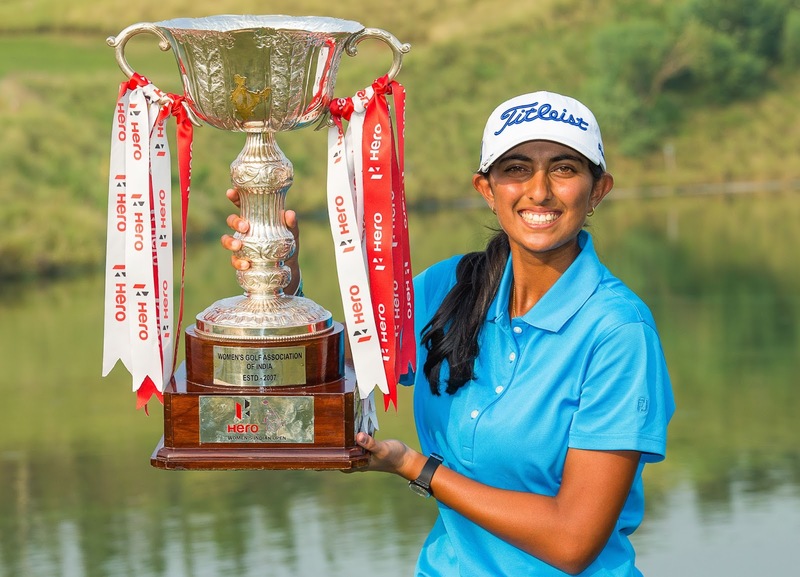 Rookie professional Aditi Ashok wrote her name into the history books as she was crowned as the first home winner of the Hero Women’s Indian Open at DLF Golf and Country Club in Gurgaon on Sunday. The 18-year-old from Bangalore became the first Indian player to win on the Ladies European Tour in one of the most romantic fairy tales that the circuit has ever witnessed. The teenager, who was inspired to become a professional golfer when she watched Laura Davies and Gwladys Nocera compete at the 2007 EMAAR-MGF Ladies Masters in her home city, first played in the Indian Open as a 13-year-old amateur in 2011 and finished eighth the following year. After winning the LET’s Lalla Aicha Tour School aged 17 in December 2015, she went on to qualify for the first Olympic golf competition at Rio 2016 in August and has continually improved, recording four straight top 10 finishes prior to her maiden victory. “I’ve had a lot of good finishes at the Indian Open and to finally get the job done feels good, especially as an Indian player in front of my home crowd. It means a lot to win this,” said Ashok, who ended with a 54-hole total of three-under-par, one stroke ahead of Brittany Lincicome and Belen Mozo. Having started the final round two strokes clear of the chasing pack, Ashok tussled with Belen Mozo for the lead throughout the back nine and she needed to make a birdie putt of four feet on the par-5 18th green to seal the victory, after Lincicome set the clubhouse target at two-under and then Mozo left her birdie putt of 20 feet just short. Ashok admitted that her third shot into the 18th green was ‘lucky’ as it was slightly long but hit the upslope in front of the rear bunker and rolled back to within four feet left of the flag. “I was planning to play just for the front but I was playing out of the rough so it came out hot and flew more. It’s a tricky hole because you can’t see the green. I don’t know. Belen hit hers left and it found the green, so she was lucky as well. I think I was really lucky on the 18th but I missed quite a few on the front nine. The course was giving back to me,” she said. In the final round, Ashok birdied the second hole to open up a three stroke lead, but she bogeyed the seventh and Kanphanitnan Muangkhumsakul from Thailand, who ended in fourth place, tied for the lead on three-under-par after 12 holes. Ashok birdied the 10th to regain the lead, but she then bogeyed the 13th dropping into a share of the lead with Mozo, who bogeyed 14 but birdied 15. Both players dropped a shot on the treacherous par-4 17th to tie with Lincicome going into the last hole and luck was on Ashok’s side. There was generally lower scoring in the sunny conditions for the final round. Florentyna Parker shot a 70 to finish fifth on level par, which was her sixth top ten of the year, while Order of Merit leader Beth Allen shot 68 to share sixth place with Alexandra Vilatte Farret (69) and Anne-Lise Caudal (73). The defending champion Emily Kristine Pedersen, who was the 2015 Rookie of the Year, tied for ninth place with Kiran Matharu. With her earnings of €54,988.20, Ashok leapfrogged Nuria Iturrios and Angel Yin into first position on the current Rookie of the Year standings with two ranking events still to be played in Qatar and Dubai.